Teachers are always being offered lists of principles, axioms, tenets, precepts – the magic beans of teaching. We’re desperate to make sense of it all – to make something very complicated, simple and easy to grasp. Whether it’s the #5minplan series from @TeacherToolkit or something like my own Lesson Observation Checklist, there’s a demand for handy ready-reckoners of one form or another. The work by Barak Rosenshine, compiling ten golden nuggets from research, is another good example. Helpfully, there’s a fair degree of overlap. From teachinghow2s.com Click for the full Rosenshine document. This week I encountered two more lists. One came from NCSL, a document written by Chris Husbands and Jo Pearce: What makes great pedagogy: Nine claims from research. It’s well worth a read. Another was by James Ko for EDT: Effective Teaching: A review of research and evidence. It’s interesting for its discussion of how we can make the judgements in the first place. There is also a list of features of effective teaching and ineffective teaching. With all these lists flying around, I thought I’d write my own set of principles. Here’s what I came up with. Not written in stone….perhaps just in dry-wipe pen on a mini-whiteboard, pending some actual research. 1. Behaviour is the bedrock – but not the purpose. You establish what you establish (Bill Rogers) – is one of the most important ideas described in my Bill Rogers Top 1o. If you want behaviour of a certain standard, you need to establish it directly and explicitly. If you tolerate anything less, you establish that as the norm. Working on behaviour is the first, most critical element in teaching effectively. However, it’s not the ultimate goal. It’s helpful to remember that the behaviour needs to be good so that you can teach and students can learn. 2. Know your stuff – it matters: the material, the nature of the assessment, the expected answers. Expert teachers know their subjects, continually study them, know how questions will be set and what the answers should be. This requires time and effort to be spent keeping up to-date. Never underestimate the importance of this or overestimate your knowledge of the exam spec. 3. Know your students – it makes a difference: names, prior data, SEN/EAL status… Names? Obviously – but surprising how hard this can be when you teach a lot of classes. For the data, a quick glance at the spreadsheet isn’t enough. You need to really know. I recommend making a data-annotated seating plan or differentiation guide of some kind to get the data off the page and into your head, working its way into your interactions in the classroom. 4. Tool them up – it’s powerful to provide all the resources students need to learn independently. It’s horrible teaching when you are the only resource; when you (or your absence) become a barrier between a student and their learning. Ideally students should have the books, guidance, questions, specifications and model answers at their disposal so they can be self-reliant to the greatest extent. This is particularly true for exam classes. Not all students can use these materials readily and need to be shown how. 5. Teach to the Top. Pitch it up: this is the route to success. A golden rule. Everyone is aiming for the same, high level – it’s just that some find it harder to reach. Don’t confuse scaffolding with setting lower goals. As soon as you hold back the top end in the hope of giving time for others to catch up, you’re putting a lid on someone’s achievement and that’s unacceptable. 6. Teach for memory as well as for understanding. It’s all too easy to think students have got it sorted, during a lesson. Students have the capacity to perform, reproduce, recycle – using short-term recall and well-developed blagging strategies (such as copying from their friends.) You can’t assume anything has been learned unless, some time later, the students can show they’ve retained their understanding and knowledge. They need strategies to do this; primarily lots of practice. 7. Plan long: know the big picture and then plan lesson sequences before you worry about each lesson. Lessons are messy; you need to be responsive – agile. Learning is a long-term process, not a short-term one. It’s important, therefore, to plan accordingly, taking account of the distribution of content over time. A lesson is then just the next part of a learning sequence that you adjust as you go along. I almost never plan lessons; I just know where I am in the sequence that has already been planned. 8. Mark lean; the best feedback is immediate and focused. 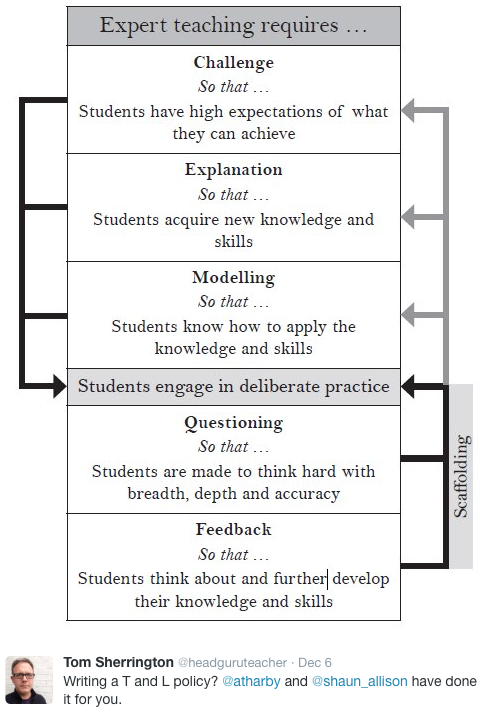 Feedback is important – otherwise how would any student ever know whether they’ve learned anything? How would you know how well you’ve taught anything? But marking is a specific form of feedback with limitations; its impact diminishes with the time elapsed since the work was done and with the overall volume of feedback relative to a student’s capacity to engage. It’s a classic paradox: the students who have the greatest needs are the least able to engage with marking comments. Marking lean means being highly selective, planning for every comment to be actioned – otherwise you’re wasting time you just don’t have. 9. Drive Exam success: know the spec, do lots of exam practice and DRIVE. Drive is an intangible quality some teachers have in abundance but others lack. It implies a sense of urgency, intensity and focus around exam preparation – tightly focusing the learning around key content, exam techniques and specifications details. Assuming we want students to get the best grades they can, this is necessary. It’s not a ‘necessary evil’ – I haven’t got time for that kind of thinking. Exams are part of life and they help students to get their act together to actually learn things! 10. Plan groupings: Two – Good; Three or more – Bad. Pair discussion gets everyone involved but, in groups with three or more, at least one person is a passenger. It’s painful and annoying to see teachers toss out questions to a whole class hoping someone will answer, accepting the one and only response, once again, from Miss Keen. Paired questions resolves lots of issues (read this if you need persuading). However, big groups are rarely helpful in most learning situations. Handle with care – someone will be hanging back, not learning much. It’s a virtual certainty. 11. Get some balance 1. Over time, a series of lessons, you need a mix of Mode A teaching (straight, rigorous cycle of explain, model, practice, feedback) and Mode B teaching (awe and wonder inputs, open-ended explorations, hands on practicals, off-piste spontaneity). I’d suggest no less than 80% Mode A for most subjects but you need some Mode B for you and for your students to enjoy and embrace the whole process. Now, obviously, I’ve completely made this up without any evidence. It’s my gut feeling. Take that for what it is. Or leave it! Or adjust the percentages. 12. Get some balance 2. You can always improve; you can always do more – but there’s also only so much impact you can have; only so much you can do. We are all accountable for doing our jobs well, for trying our best to teach well, for pursuing our continued professional learning with vigour and determination and for going an extra mile to support students in any way we can. And then we go home – with our heads held high and a clear conscience. The rest is up to them and their families. This matters – not just for us, but for our students too as how else will they learn to stand tall with the world at their feet. Those are mine – what are yours? « My 2015 Blogging Scrapbook. Excellent post Tom. My favourite saying apply to all types of context in life and perhaps most to point 12.2. ‘You can take a horse to water but you can’t make it drink.’ Some people only learn from big mistakes! This is great Tom . I might add the importance of self reflection – we all can become that little bit better if we just spend a little time thinking about our practice . Best wishes for 2016 . Absolutely. Agree with that. Best wishes to you too. Superb Tom. More common sense on the traditional or progressive (false) dichotomy with number 11. A great list. Enjoyed this, Tom – thanks for sharing. Will use it with trainee teachers in August again if that’s OK – properly credited, of course! I have read it with great interest. Over the last few years I have worked my way through many books and articles, but the way you summarise the principles of effective teaching looks like a very good plan for a CPD programme for both experienced and trainee teachers. I also see it as an effective list to evaluate a lesson or my own practice to avoid getting a bit rusty. I would add to behaviour: respect your students and what they can achieve, but still have high expectations. Yet another brilliant post that strikes a real chord with me. Its quite spooky – Along with some of your assembly ideas I’m starting to worry that along with Tim Lovejoy I have two brothers from other mothers. …Can I say though that your own selection of 12 principles I think are absolutely excellent? Every single one of them subtly attuned to what really matters, and right in tune with my own filtered prejudices. What also seems interesting to me is how you have clearly been ‘evidence informed’ but don’t pretend that this is a list of research findings. All the better – it requires the holistic wisdom of an experienced practitioner to pull together the best bits of research into lists like this. Loved the principles, simply amazing post! I must share it with my colleagues. Simply put, this is fantastic, thanks. First, to the area I think I can improve on: exam DRIVE. Once I have taught the course, checked the students’ learning, and done 100 past papers, I just get bored. This will come across to the students, and I will think about how I can change my attitude towards it. being confident enough in one’s behaviour systems and preparations to deal with disruptions calmly. Thanks! Totally agree re sleep! Our mental state can have a major bearing on how each day pans out. Only just seen this. Really good list of principles. Tahnks, Tom. The only one I would perhaps query is number 10. I would argue that oracy skills, listening skills and exploratory group talk are really important skills for children to develop beyond pair work. Don’t get me wrong, I’m a big fan of Think, Pair, Share but I’m just not sure it should be the only way. Teachers should guide and support children to develop these skills in different contexts. Also, one further thought, does ‘hanging back’ really equal ‘not learning’? Listening to, considering and contrasting different points of view are also important. Perhaps number 10 ought to be ‘Plan for talk’ … ? Really great read. Keep up the good work!